For our last evening in Tuscany we were treated to a cookery class that turned into a feast with Tuscan supercook Anna Bini. 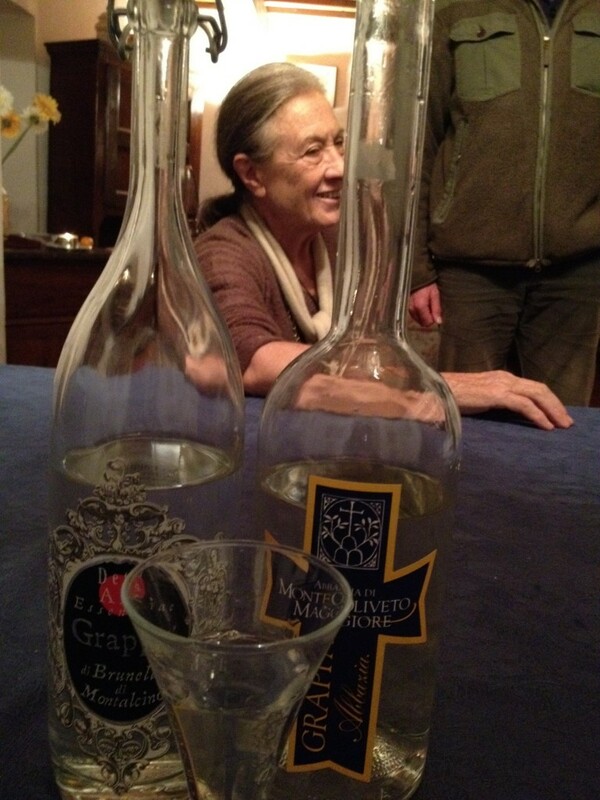 Anna is a vivacious 80 year old who runs three restaurants in Paris, Casa Bini, Primo Piano and Oanosteria as well as promoting the pleasures of Tuscan food internationally. We had been staying in Anna’s beautiful farmhouse Il Monte just to the east of Florence thanks to the villas in Tuscany specialists Tuscany Now and had opted to spend our last day enjoying Florence not quite certain what the evening would hold. 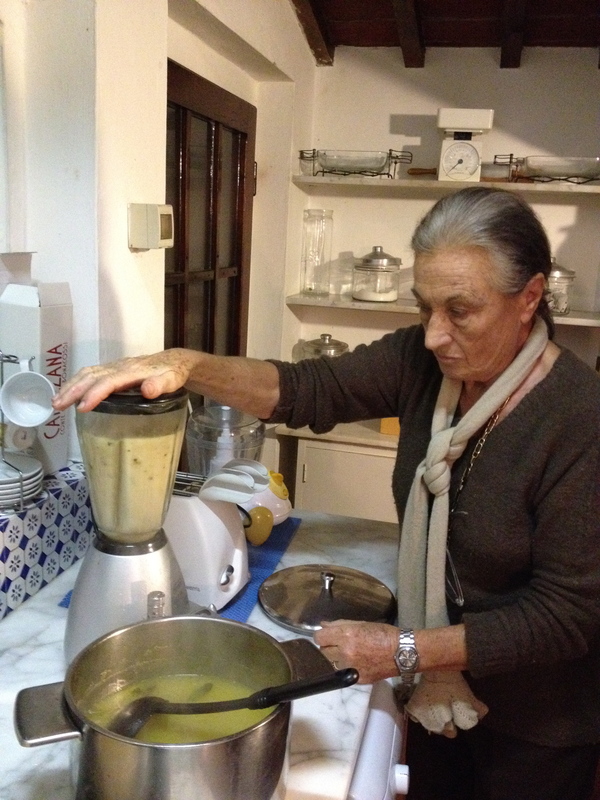 On returning to Il Monte the kitchen and fridge was packed to the brim with gustatory goodies and then Anna turned up ready to cook with her assistant as well as the Tuscany Now team. 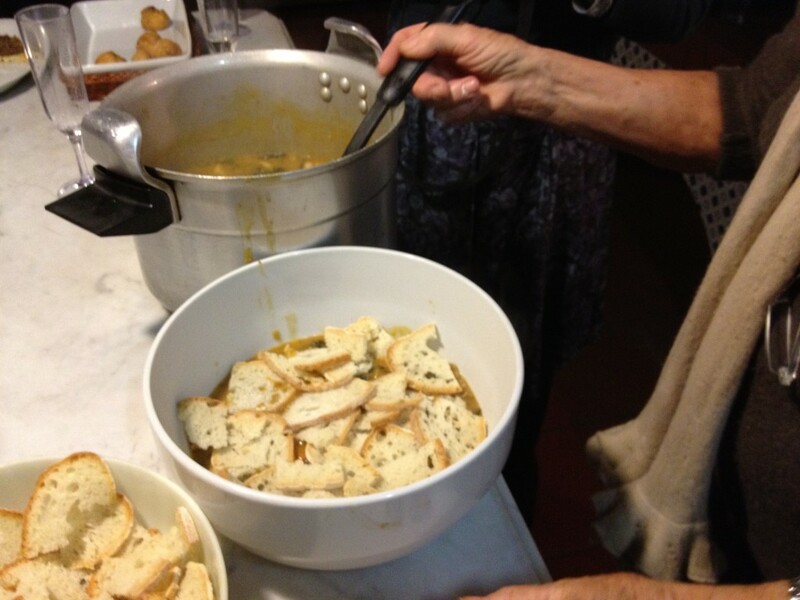 I had put in a request that Anna would prepare Ribollita, the Tuscan bean, vegetable and bread soup. 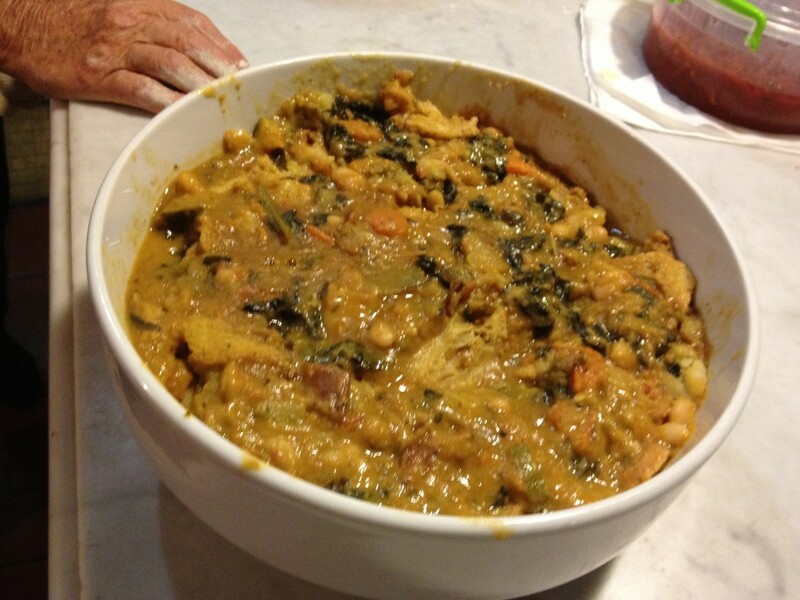 Every Tuscan cook has their own take on Ribollita normally based on their grandmother’s version-somehow all Tuscan women seem to defer to the grandmother rather than the mother in matters gastronomic-and I was intrigued to see how it would turn out. 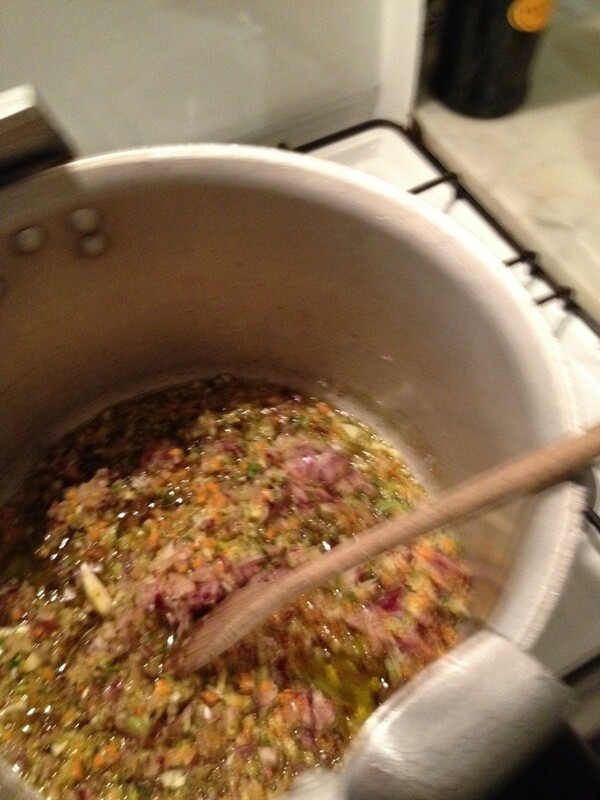 As a base on which to build flavours Anna started with onion, carrot and celery very finely diced into a Mirepoix. 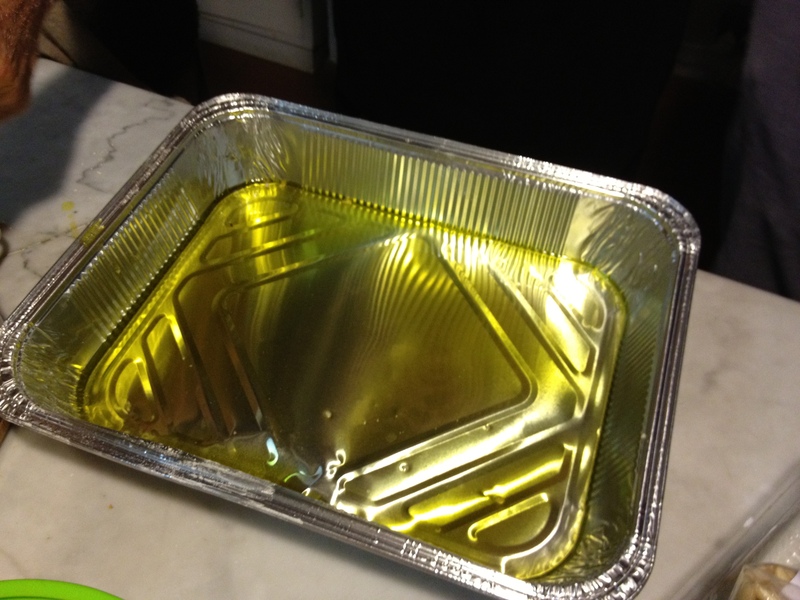 She added olive oil and white wine cooking it up until the vegetables had darkened and the wine had boiled off. 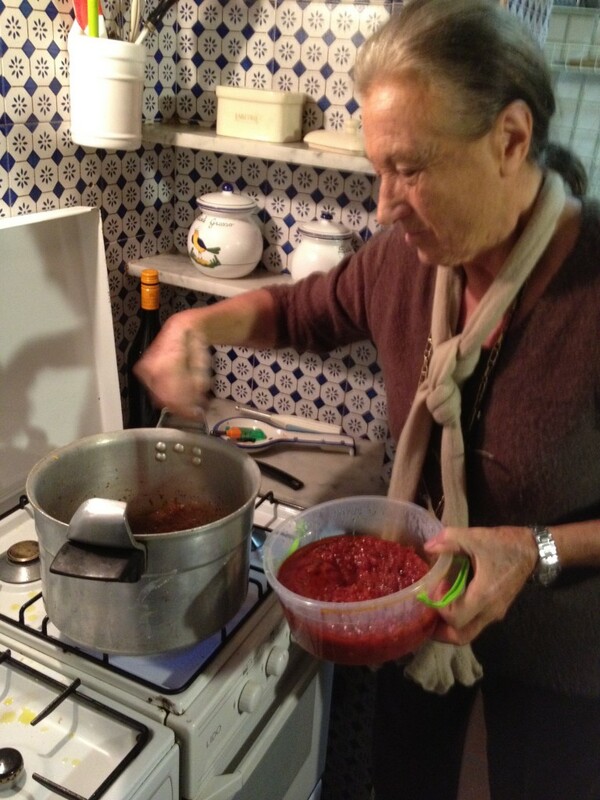 Next she added some tomato sauce (passata) and lots of olive oil. 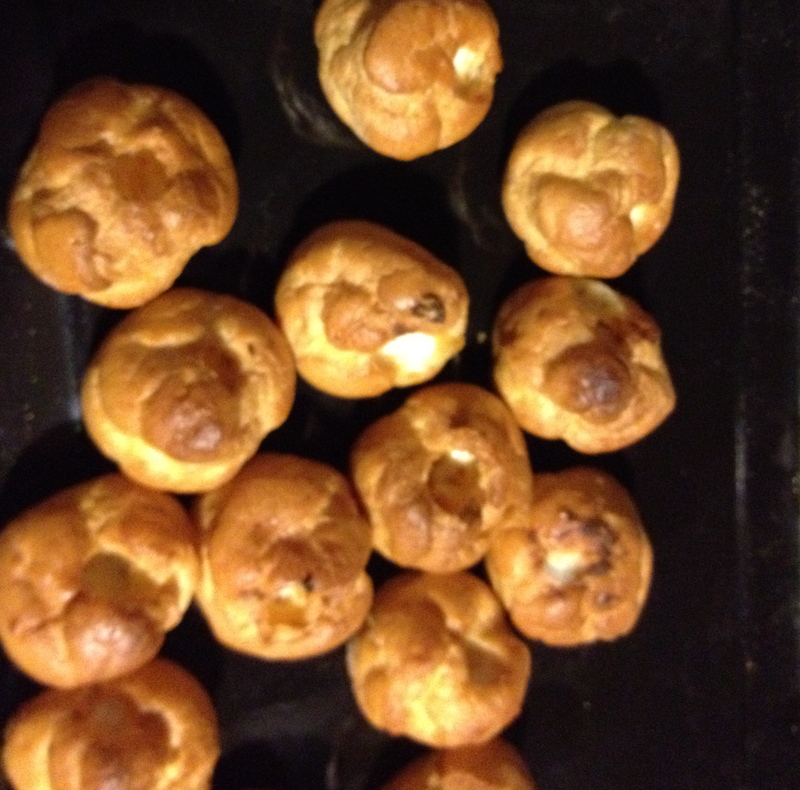 Anna cooks by feel not with measured recipes so apologies for the lack of exact quantities! 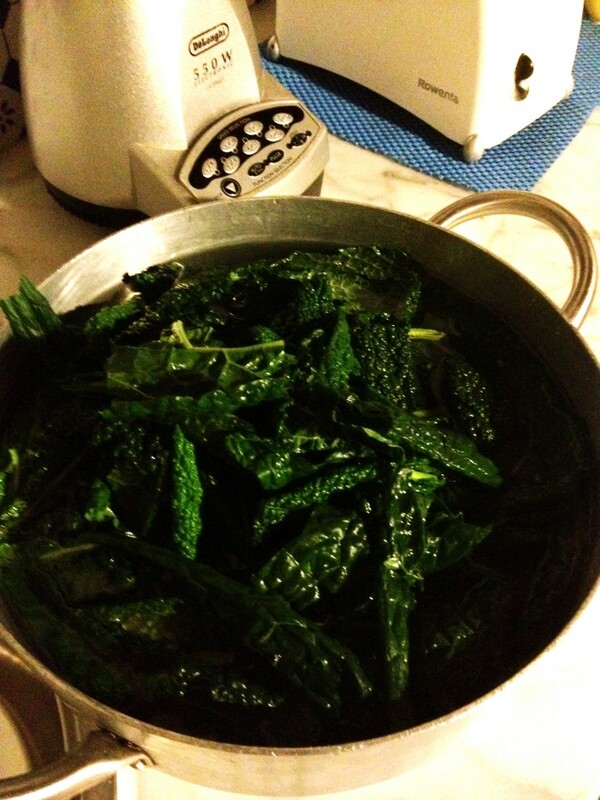 A large saucepan of leaves from the Cavolo Nero cabbage, the Italian ‘black’ winter cabbage that tastes better the harder the frost, was added and then a mix of sliced courgette, potato, carrot and celery. Whilst the vegetable blend was taking shape Anna had been boiling pre-soaked white cannellini beans with a big bunch of chopped fresh sage, garlic, olive oil and salt in a pressure cooker for 20 minutes (45 mins in a normal saucepan) half of which was blended and then added to the mix. The remaining whole cooked white beans were to be added at the end. The Ribollita was left to simmer and thin cut slices of stale Tuscan bread that had been crispened in a wood-burning oven were placed in a bowl ready for the vegetables and beans. This process would then be repeated once the first layer was in place. 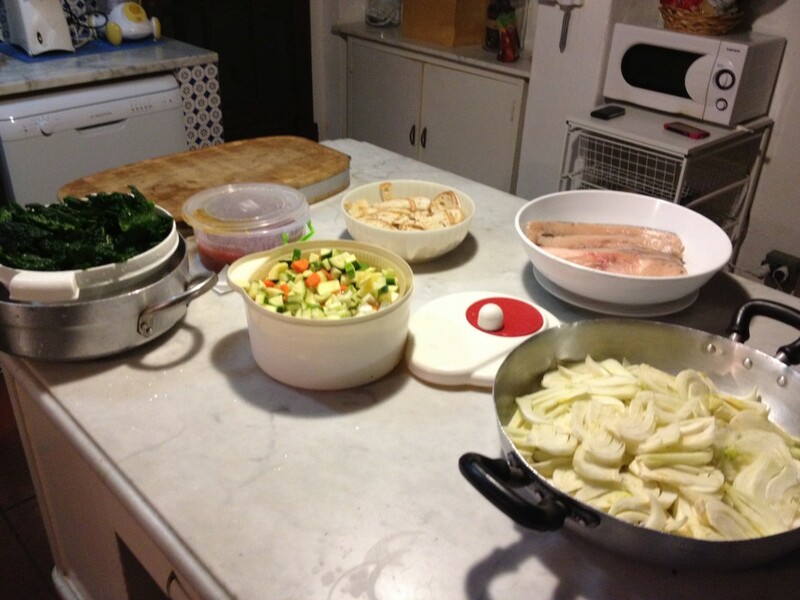 The main course was to be sauteed Fennel (Finocchio ) and Swordfish (Spada). 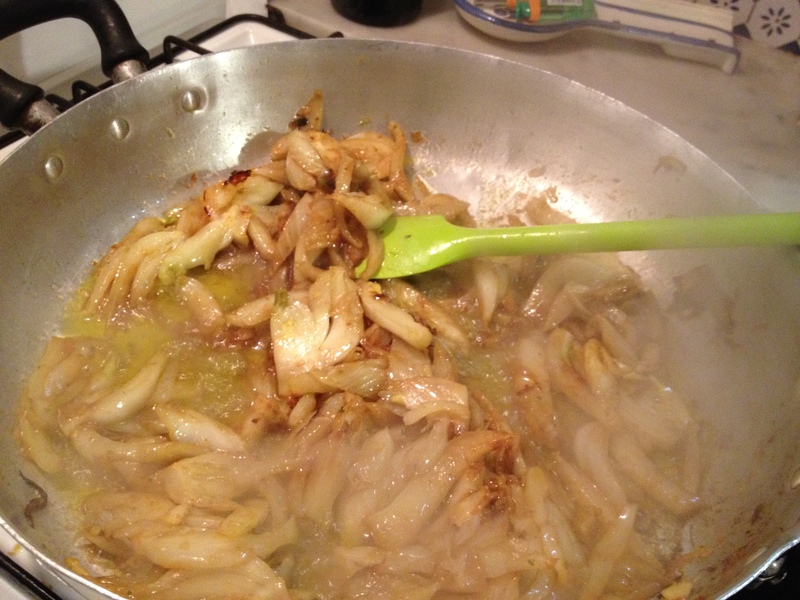 The fennel was saturated in olive oil, and then Anna added a largeish dash of white wine and a good sprinkling of powdered vegetable bouillon, the pan was then covered and the vegetables sauteed until nearly burnt. An aluminium pan is better than steel as it catches less. 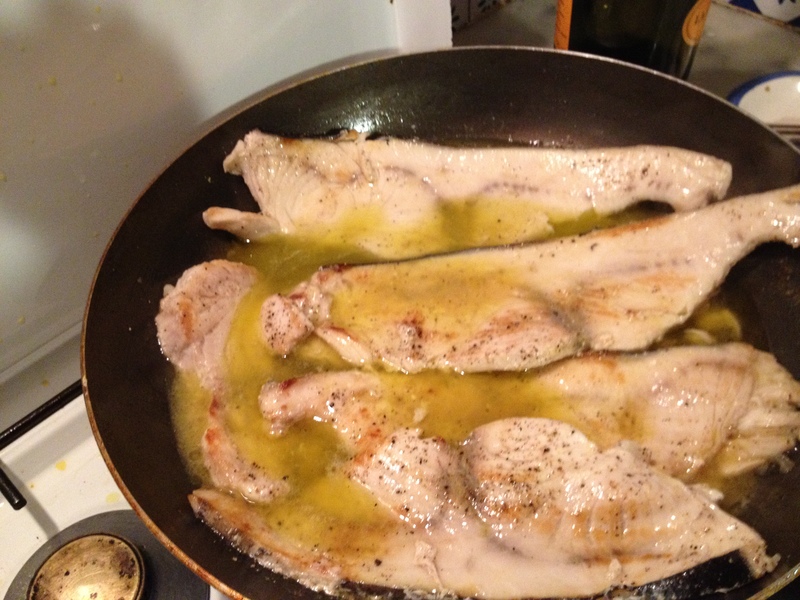 The fish was dried on a paper towel, placed into hot oil and then sprinkled with salt. When it was done on one side the fish was turned and pepper added. Let the liquid soak into the fish a bit before serving. The final element in our feast was to be Castagnaccio-the Tuscan chestnut flour cake. 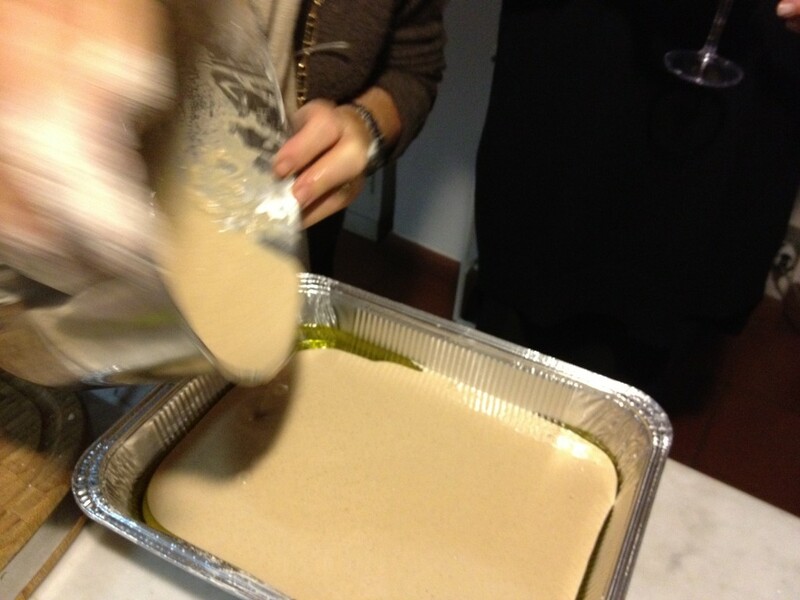 Add hot milk to sieved chestnut flour (300 g flour) to the consistency of single cream. Add more flour and water. add the flour and milk blend, then mix. 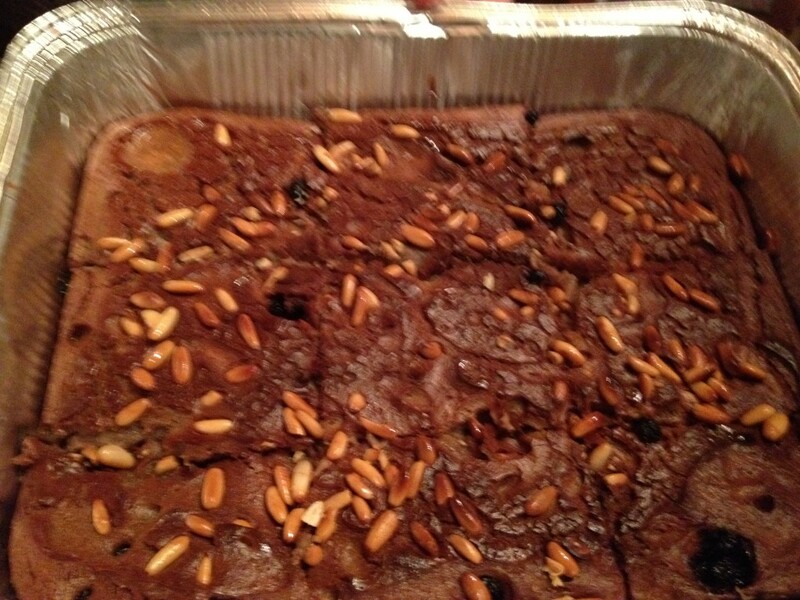 Add pine nuts, raisins and rosemary and more olive oil on top. 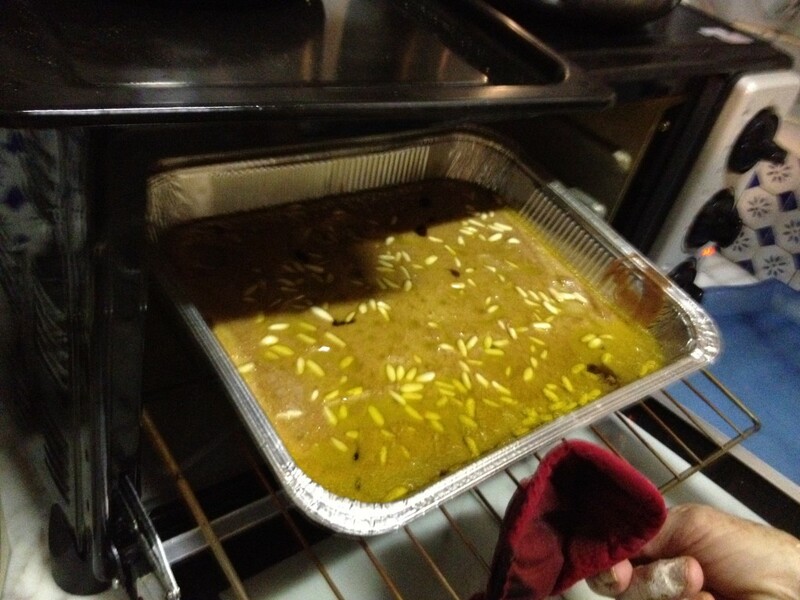 Cook in the oven at 225 degrees centigrade until done.